The energy body is more than a metaphor used to describe the activity we associate with the concepts of the chakras and prana. Western science and Eastern philosophy merge with the phrase “energy body,” to refer to the actual, physical reactions to external stimulus. The brains of people who suffer from various levels of trauma exhibit a wide range of physical reactions that can be described as a disconnect with their bodies and are often marked by the inability to be “present” in a way that allows clear focus and concentration. Trauma, like many complicated ailments that appear as a wide spectrum, is easier to spot in their extreme expression. Recent studies into PTSD (post traumatic stress disorder) are a good illustration of trauma in the extreme because the experiences of people who suffer from PTSD are cut in such stark relief against those who experience mild depression or the stress of everyday life. PTSD can be looked at as over-the-top trauma that is so extreme as to be paralyzing in every way: socially, psychologically, physically, emotionally, etc. It is with great interest to bring together a discussion of two ends of the spectrum – the extremes of either being present in the body or being unable to be present. What are the physical, chemical, energy body reactions that pull us between these opposite poles of being in the world? Every moment of our lives is characterized by our physical reaction to the world around us. As it turns out (surprise!) we are primarily operating from the emotions and the physical response to our environment. It is a secondary response when we act from our brains logical response to emotional stimulus. The following article by Bessel A. 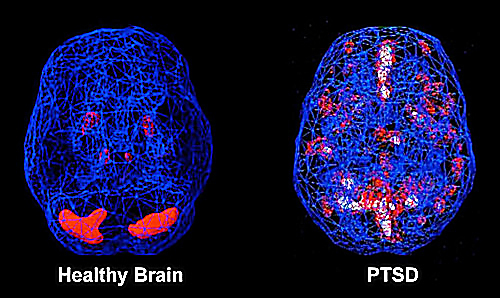 Van der Kolk, a psychiatrist from Boston University who speaks and writes on the topic of PTSD demonstrates surprising details of what goes on in the brain of the traumatized person. Dr. Davidson is at the center of a field of research involving meditation and its effect on the brain. His numerous studies utilize structural and functional brain imaging technology performed in a state-of-the-art facility focused on neuroscience, psychology, physics and statistics. 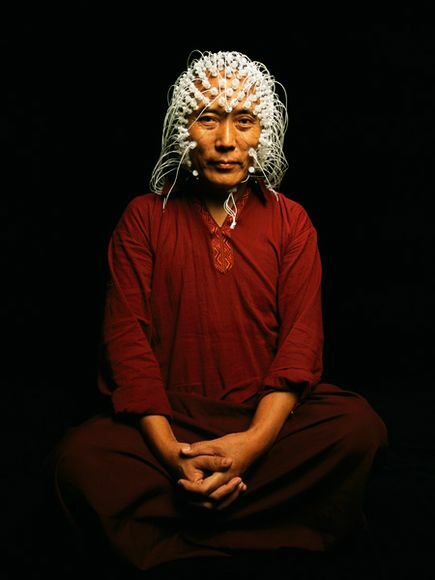 One such study involving Tibetan Buddhist monks, with tens of thousands of hours of experience meditating suggests the actual structure and the function of the brain can be altered through the practice of meditation. The concept of “neuroplasticity,” the ability of the brain to change throughout our lives in response to our experiences is at the core of understanding the effects of meditation. Davidson first studied Matthieu Ricard, a French-born monk from India by hooking up 128 electrodes to his head and recording his brain activity as Ricard meditated on “unconditional loving-kindness and compassion.” Two strikingly unusually results were immediately apparent: Ricard produced powerful gamma brain waves oscillating at 40 cycles per second and oscillations from other areas of his cortex were in synchrony in a fashion similar to that of patients under anesthesia. Gamma brain waves are often faint and hard to pickup but in Ricard’s meditative state they appeared unusually strong, indicating his ability to maintain intensely focused thought. These results led Davidson to expand his study to include more monks and to include college students with little or no experience at meditation. The end result was that the monks produced gamma waves 30 times as strong as the students. The other finding was that the monks had larger active areas in their brains as compared to the students. Of significance was the area of the brain responsible for positive emotions, the left prefrontal cortex. After a negative event or emotionally charged situation meditators recover and return to a calm state faster than individuals who have not developed calming skills. The monks are an example of this skill where they have learned compassion mediation. Their ability to activate the prefrontal cortex in response to the situation and modulate areas of the amygdala helps them to reduce reaction and quickly return to a state of calm. The ability to “down regulate” the amygdala is key because that is the area of the brain that forms and stores memories associated with emotional events and is concerned with vigilance and threat detection.